BONWI.com is a travel search and booking site giving travelers massive amounts of points in exchange for hotel and car reservations. Points can be redeemed for flights, hotel stays, car rentals and gift cards. BONWI.com is most incredible travel rewards program in the world. We offer you a large selection and great rates for hotels and cars you would find elsewhere on the web, then add thousand of travel rewards points on top of each booking, plus a price guarantee. The ease of use, rate you earn rewards and lack of restrictions will have you saying… "Let's go BONWI"! How much does it cost to join BONWI? Nothing! It's completely free to create an account. In fact, when you register we give you your first 1500 BONWI Points absolutely FREE. Is there a catch? How can BONWI offer such incredible rewards? BONWI.com's unique infrastructure gives us access to special rates from hotels that our proprietary algorithms then pair up with extraordinary rewards offers. While other sites use most of their commissions/margins to pay for expensive advertising and support their stock prices, we return value to our customers in the form of BONWI Points. It's so simple! 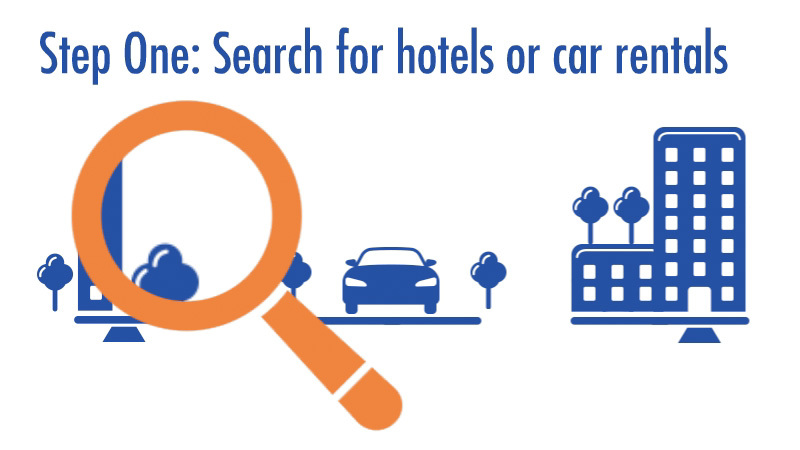 You search for hotels and/or car reservations; along with the lowest rate we also show you how many BONWI Points you can earn. Once you book a reservation and complete travel within 3 to 7 days, your BONWI Points are posted to your account and are available to be redeemed. Why does searching take longer than other travel sites? Unlike other sites, we don't source our rates through just a single supplier. Instead, we bring you exceptional value by connecting in real-time to dozens of global companies, so the response rates can often exceed other sites. But it's worth a few seconds more. In fact, you may see offers where you can get over 8,000 (or more) BONWI Points per night. How do I know that I'm getting a good rate? Behind the scene we are using a sophisticated price comparison engine! In real-time we compare rates against the most popular travel sites each time you search, and we present you the best rate we find. This process allows us to stand behind our prices with a 110% Guarantee. Am I able to pick my room? Yes. In the search results we will default to the lowest rate category of room we find, but simply click the "select room" button on the results page and we will show you all the room types available and the rate for each. We accept all credit cards on the Visa and MasterCard networks, as well as American Express for selected currencies. Is it safe to use my credit card on BONWI.com? Absolutely! We take your data security extremely seriously. BONWI.com uses a secure commerce server with the latest encryption technology to process your credit card information. We do not keep or store your credit information after a transaction, which prevents any risk of data or identity theft. And we never share any information with any 3rd parties, NEVER. How can I contact BONWI.com? We're always here to help. You can enjoy our live chat feature during business hours or Email us at service@bonwi.com. If your inquiry is in regards to a specific reservation, you may also give us a call using one of the phone numbers shown in your booking confirmation.